I don't know why, but every time I fly I feel like I'm going to become a big-time blogger. Maybe it's because I'm doing something out of the ordinary and have something to write about. I don't think someone wants to read this every day ... "I woke up, ate breakfast, drove to work, did some work, taught some lessons, drove home, ate dinner, watched a show and then I went to bed...again." If you do want to read that over and over every day, feel free to access this post as often as you like. I won't charge you. I did have a very good trip out to Hays, Kansas with Greg Howlett. We were here last year for the first time because members of the Daybreak Quartet were unable to travel out. It went so well that the producers of the show asked us to come out and do it again, and they have asked us back again for next year, once they work out the details. It is a blessing to know that our gifts are able to be used by God to bless and encourage others. I recorded a couple portions of the program this year, at least, I recorded myself during portions of the program. (You can see videos here and here). We get to provide the soundtrack for the onstage drama of the last days of Christ on earth. We are tucked into a corner of the stage and are unable to be seen by most of the audience, which is fine with me. I might suggest for next year that we move completely backstage and give the production more room on stage. During the first night's performance I noticed that I was receiving a number of text messages, so during a break when I wasn't needing to sing, I checked my phone to discover that one of my voice students, Ms. Miriam Williams, just won First Place at a talent show put on by the Kiwanis Club in Henry County. She won a scholarship of $1,250. (maybe I'll raise my lesson fee now). She is very talented and hard-working and deserved this award. Pray for her as she auditions for college admission and scholarships in the next couple of months. 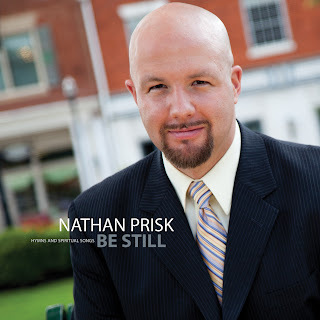 My solo CD, Be Still, has been doing very well and I'm about to place my second order for more. I just wanted to let everyone know so if you need me to order and extra thousand or so for you, make sure you let me know soon. Bulk pricing is available! I'm only kidding, unless you are serious. I will get to sing in Macon, Georgia next month at Mikado Baptist Church. If you know of friends who live in that area, please let them know. I will be there all day, April 21st, singing mostly in the evening service. I'm en route back to Atlanta via United Airlines. Don't worry, I didn't bring any guitars with me. (Google "United breaks guitars") They don't give you any pretzels. On our way out, I was in the process of powering down my phone, when I stopped to say something to Greg next to me. As I was speaking, the attendant saw my phone still on, stopped to give me her best "you've got to be kidding me" look and said "reaLLY?!?" Greg then helped the situation by saying "can you believe him?" Not helping Greg! I didn't get kicked off the flight, I'm assuming because common sense still exists in some places in this world, although those places are getting harder and harder to find. Whenever you find one, make sure to drop a pin on your smartphone so you can find your way back should you need any. It is now one hour past our original arrival time into Atlanta, and we are sitting at an airport in Savannah, Georgia. We didn't have enough fuel to circle the Atlanta airport while it was shut down for severe thunder and hail storms. We get to sit in these extremely comfortable seats for at least another hour or two. I know you wish you were able to be a part of this amazing adventure. Maybe one day, you will get to experience it for yourself. It is now 7:06pm. After sitting at the Savannah Airport for one hour, we are on our way again. I'm looking forward to getting home to my family. I hope that the storms in the Atlanta area have not done too much damage. My brother, Jason, was on his way to pick me up and got caught in the middle of the hailstorm. His windshield is cracked and he doesn't yet know what the rest of the car looks like. He said the hail was baseball size. ....I made it home. I'm doing fine. Who knows when I will blog again? If it is going to go as well as this trip, maybe I'll wait awhile. For the last 7 or 8 years, the Daybreak Quartet was privileged to be a part of the "Living Last Supper Drama" in Dodge City and Hays, Kansas. Last year, due to sickness (or possible poisoning, nothing was ever proved) of two group members, it was left to myself and pianist Greg Howlett to fly out and provide the music for the annual production which 1500-2000 attended. I guess we did a decent job because they asked us back...just the two of us...not the quartet, mind you. Okay, that might be because the quartet stopped traveling in December and was unavailable, but that claim has not been substantiated. I do ask that you would pray for us as we return to Hays this Friday evening. Pray that the songs we sing would be the ones that people need to hear. Pray that the message in the music will prepare hearts to receive the Gospel within the drama. Pray that as we are privileged to lead the invitation at the end of the evening we will allow God to speak through us what needs to be heard. If as Christians we act according to our own abilities (do we have abilities of our own and not from God? ), it is very easy to get in the way of what God wants to do. Thank you for your prayers, and God bless you!